The ST is a resilient seated 125/150, ductile iron wafer style (STW) or lug style (STL) butterfly valve available with either BUNA-N or EPDM seats. Disc material is 316SS. 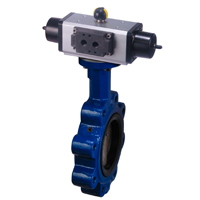 The valves are equipped with a choice of manual handle, pneumatic or electric actuators and are available in 2-in. through 24-in. sizes.